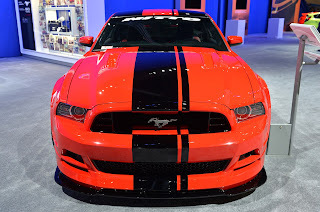 Shelby first announced a widebody kit for the 2005-2009 Mustang back in December, and a similar package for the 2010+ Mustang a month later at the Detroit Auto Show in the form of an 850 horsepower GT500 Super Snake. At the time we asked company representatives if the widebody kit would be available for the Shelby 1000, and the answer was a resounding yes. In fact, they told us that one was already under production. Fast forward a few months and the first production widebody Shelby 1000 is making its debut at the Fabulous Fords show at Knott’s Berry Farm in Southern California. The car was scheduled to be delivered to its lucky customer later that day, who would drive it home from the show. Out of any Mustang in the Shelby lineup the 1000 could use the widebody package the most, with the 345/35/R20 tires helping to put the massive amounts of horsepower from the supercharged V8. This particular model was a 950 horsepower “street” version, as the S/C model isn’t street legal on California roads. Want to see the Shelby 1000 Widebody in more detail? Check out our live photos from the show in the gallery below. This entry was written by by MustangsDaily (Mustangs Daily) and posted here on Monday, April 22nd, 2013 at 12:09 pm and is filed under 2012 shelby 1000, 2012 shelby 1000 widebody, fabulous fords at knotts, Photo Galleries, shelby, shelby 1000, shelby 1000 widebody, shelby widebody. This article was not written by us, rather gathered using RSS feeds listed here. We take no credit for this article. You can leave a response, or trackback from your own site.